I spent the past four days, sunrise to sunset, at the Cox Classic wandering around the event, helping out where I could and just taking in the tournament, a wonderful community event. The 9th hole was one of my favorite places to watch and there in front of me near the 9th green was a young man, Matt, from Atlantic, Iowa. He was dressed like a pro golfer with bright shirt or shorts or both (depending on the day) and standing right where the players walk off of the 9th green. Matt has attended the Cox Classic over the past few years and even talked his parents into getting him out of school for Friday’s round. Matt has collected signed golf balls and other souvenirs from the golfers as they leave the hole as he stands there and applauds. Matt caught my eye, so with the help of the Cox Classic volunteer tent and Lexus of Omaha, I went and got him a bag of stuff…hats, a shirt, and other things from the event. I also gave him a $50 bill and told him to do with it as he wished. I never met his parents, although they weren’t far away. They were somewhere in the stands, but clearly they have made their mark on this fine young man. He was very impressive and handled himself like a professional…maybe a professional golfer someday! My Giving50x52 presentation to this 12 year old (7th grader) was the most public of all of my gifts during the year. Several others listened in as I told him of my Giving50x52 and my gift to him as week52. I thought best with his age to do this gift in the most public way possible and this blog does not have a picture of him to respect his privacy. Matt is such a fan of the Cox Classic that he talked his parents into bringing him to Omaha for the event so he could camp out on the 9th green and meet the golfers and get an occasional signed golf ball or other hand out…for three days! 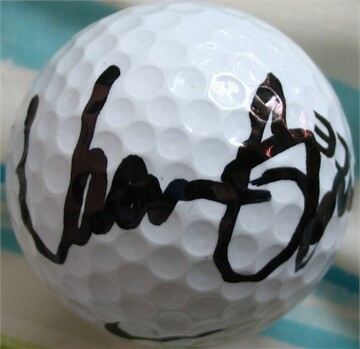 He told me he had well over 40 signed golf balls prior to this tournament and I’m sure he got many more this year. Matt plays football and basketball, but his passion is golf. I found it appropriate to end my Giving50x52 year with a young person that impressed and caught my eye. I know that Matt is on the right path and will do great things. He has determination and great family support. I wish him well! P.S. Nan, Matt’s Aunt, posted on the main Giving50x52.com page a little more information about Matt. I would agree with all she said as Matt didn’t boast about his aces and was incredibly respectful. He shook my hand and looked me in the eye and was making friends around the 9 green by the minute! I am very glad I did Giving50x52 and if I had the chance to do it all over again…I would. The journey greatly exceeded my expectations. I am amazed at the wonderful people I met…truly great souls who made as much of an impact on me as I ever could on them. I often felt uncomfortable approaching people for these gifts and was usually out of my comfort zone…and loved it. I learned about some local and international non-profit organizations and the great work they are doing. I learned much about people, organizations…and myself. I want to thank you for reading, commenting and supporting the journey. The blog, as I suspected, was an absolute necessity to ensure accountability to me to fulfill the year. I can’t imagine completing this year if I didn’t have a public journal to hold me accountable. Having someone actually read some of these blogs was not only a surprise but a tremendous motivator and, again, I am greatly appreciative of your time and following! Justine caught my attention…and the attention of most every car passing her on the street. 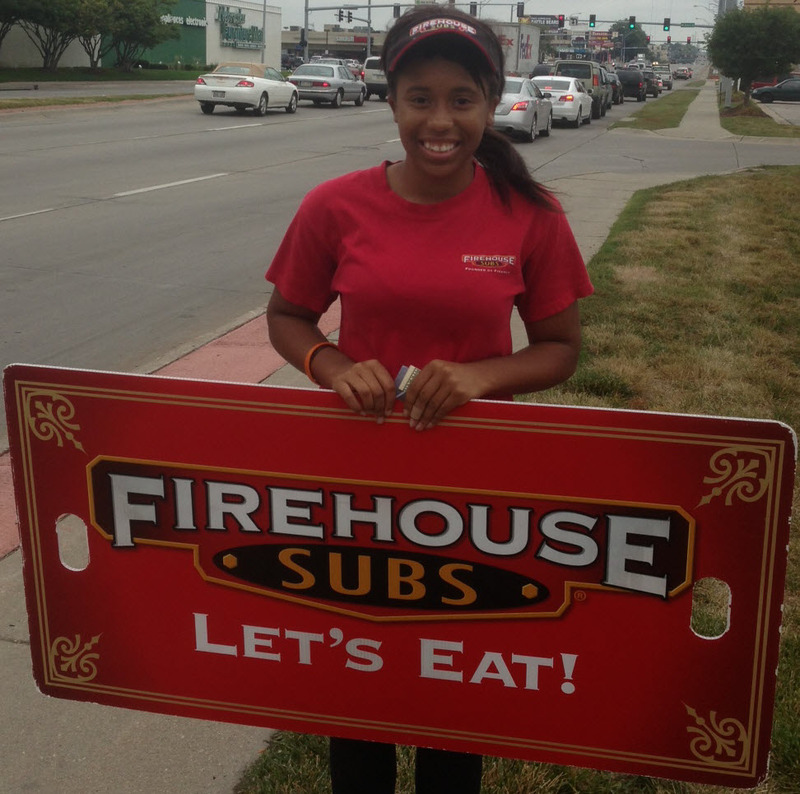 She was standing, rather dancing, on the sidewalk holding a sign for Firehouse Subs. She was smiling, waving, singing, dancing and jumping up and down. I pulled over and watched for about 5 minutes and cars were honking and people driving by were smiling. Some were pulling in to the business. She was making people laugh and smile. So, I approached her and introduced myself, Giving50x52, and asked her to be week 51. She got excited and said yes. A little about this impressive young woman…Justine is from Birmingham, Alabama but has lived in Omaha for 12 years. Her dad used to be a minister but now is a regional manager for Direct TV. Her mom is a caregiver and also homeschools Justine and her 5 siblings. Of the six kids in her family, Justine is third oldest and they are all girls except for the youngest. Justine is in her last year of high school and is starting to look at colleges. She said she wants to stay close to Omaha and is considering Creighton and UNO. (I told her we really want her to come to UNO!). Justine has worked at Firehouse Subs since November 2012 and two of her sisters also work there. She said she loves to sing and to play tennis. But back to Justine’s sidewalk antics…she approached her task of waving the sign at motorists with such tremendous passion, enthusiasm and fun. She was not wearing headphones and listening to music…she was creating it by singing and dancing and swinging around. Justine provided a great reminder to us all that you might not be doing a task you necessarily love or want to do the rest of your life, but you can still give it your all. Do it with gusto. Just when I think I’ve met about the most impressive person on my Giving50x52 journey, along comes Justine and then I’m not so sure. Justine was very personable, bright and fun. I really hope to see her at UNO in the fall of 2014! We largely ignore the homeless. We pass by them and seldom acknowledge their existence. And by “we”, I really mean “me”. On Friday I was downtown for a luncheon and heading back to campus and noticed what looked to be a homeless guy on the sidewalk. I pulled my car over and had a chat with him. 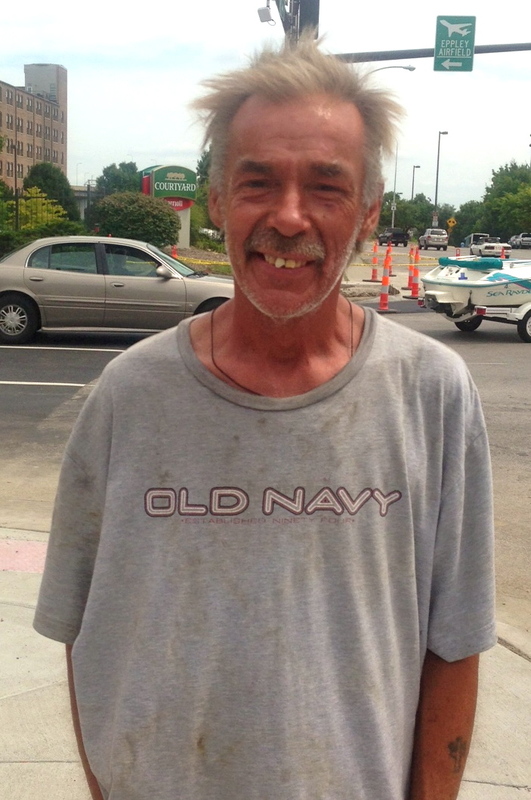 Gary, who is 59 years old, was born in Omaha but mostly raised in Council Bluffs. He lived in Florida for many years and worked as a supervisor for 22 years at a furniture manufacturer until they went out of business. Gary has never been married and says he has no interest in being married, but did live with the same woman for 15 years for a stretch while in Florida. He came back to Omaha about seven years ago because of the loss of his job and this is where he has lots of family…his mom, sister, and nieces. Gary is now homeless and calls the Francis House his home. At first when I approached Gary on the street, he was defensive and unsure of why I was talking to him. My guess is that homeless people aren’t approached often by people in suits who want to say hello and shake their hand. But we got past the initial uncertainty and I told Gary of my Giving50x52 and that I wanted him to be week 50 and his eyes lit up and got very big. He said, “SURE”! Gary thought what I was doing with the Giving50x52 was a little strange (ok, a lot strange). He couldn’t understand why I was doing it or why anyone would do it. Maybe my reason is the smile it put on his face and the brief moment of excitement it gave him. In just a few minutes, I saw Gary’s mood change dramatically. We had a good conversation. Gary told me of one of his favorite times of going to Busch Gardens in Florida. As I left, I asked him what he might use the $50 for and he said to get something to eat and to get some cigarettes. I’m glad I didn’t ignore Gary on Friday and had the chance to meet him. I absolutely love those surprise soldier homecomings or reunions at sporting events. Sometimes I see them on ESPN and think, “dang, wish I was there”. They move me. On Friday night (July 26th), my wife and daughter and I went to the Omaha Storm Chasers game. While I was walking back to my seat, I overheard the between inning quiz/interview with a wife of a U.S. soldier. She was asked a number of questions and at the end she was asked what she would want to say to her husband, who is deployed overseas. She said something to the effect of, “Love you and I can’t wait to see you in a week”. Of course the announcer said, “why wait, tell him now…he is here tonight!” They hug, kiss and everyone applauds. When the couple walked up, I introduced myself and my Giving50x52 journey and my request that they be my week 49. They agreed. Brent, from Georgia, just returned from 8 months in Afghanistan. He is in the Marines. His wife is Stephanie and they were officially married in December, but they said a true ceremony is yet to happen…likely this fall. 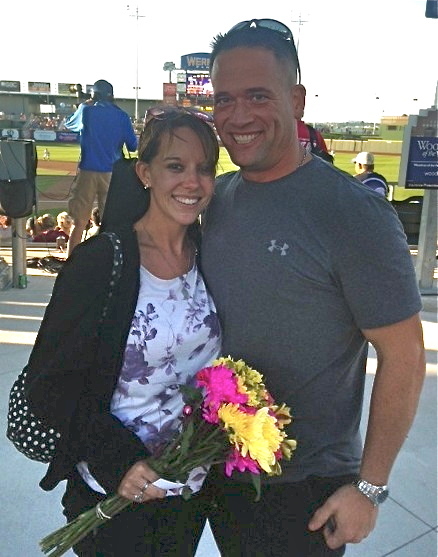 They met while Stephanie was travelling with the USO in Twentynine Palms, CA. Stephanie’s dad is retired military and their family moved around a lot, but Papillion has been home for the past ten years and is where her father retired. I’m proud of and appreciative of our military personnel. These surprise homecomings captivate the emotion of the separation, and the reconnection, with their family. 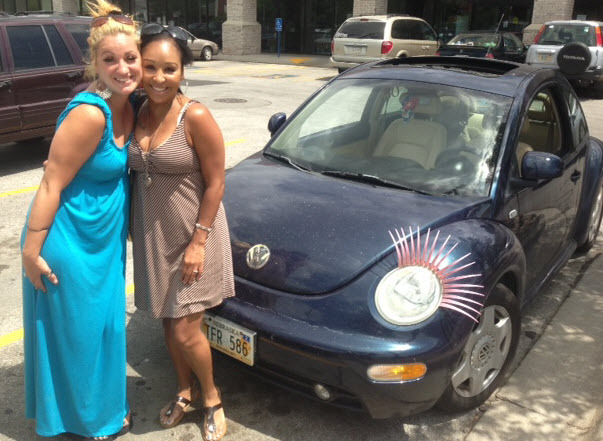 Brent, I salute your service to our nation…and Stephanie, I applaud your strength and support. I was honored to meet both of you! Hi! This is Brent and Stephanie from the Omaha Storm Chasers game. We are so thankful to be a part of your 52 weeks of giving. We wanted to let you know how much it meant to us that our reunion touched your heart, the way it touched ours. We apologize for the delay in writing to you, but we have been on the road for the last 5 days. Our journey is taking us to Albany, Georgia, where Brent is now stationed. It was my last night in Nebraska, and I had planned to spend it with my family prior to leaving the state to meet Brent the following week. He was “scheduled” to return on my birthday (August 3rd), but had been planning with my family all along to sneak up on me at the game! I have watched so many of those homecoming videos, and always had Brent watch them along with me…it was my way of getting through the deployment. I’m so glad we were able to have a moment of our own…it was definitely an unexpected surprise of a lifetime for me. We are so glad you were able to share in it with us. We wanted to let you know that your gift was put to good use. We used the $50 to assist in getting Brent home to reunite with his children…another long awaited, special moment for our family. Thank you so much for all that you are doing. I imagine you have touched so many lives this year; even more than the 52 people you have crossed paths with. What a wonderful example you are setting for so many. We were touched and inspired by your kindness, and look forward to following your continued journey of giving. I’m going to call this week…patience and patients. It hasn’t gotten much easier…approaching people that I don’t know, initiating conversation and handing them a $50 bill. And some weeks it just seems more difficult than others. Maybe I’m trying to make it fit my schedule or my plan. It goes back to something I wrote about early on in the year about consciousness and awareness and not forcing something that doesn’t seem or feel comfortable or right. Have patience. So as difficult as this week was to accomplish, it was well worth it. Things have been tremendously busy at the office lately and I worked through the noon hour again on Friday, so I drove out for a quick, late lunch. 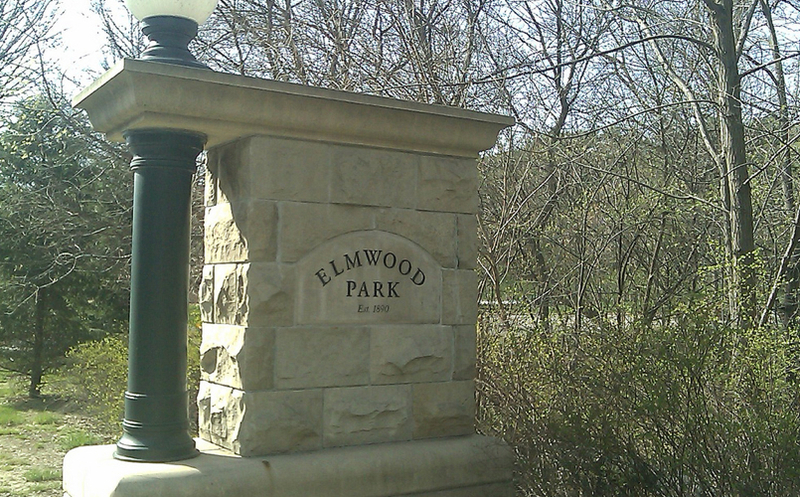 When heading back through Elmwood Park, I unexpectedly spotted my next Giving50x52 participant. Liz was hanging out in the park on a blanket…studying, listening to music and generally enjoying the day. I selected her because I wished I was doing the same! Liz is a nursing student at Nebraska Methodist College and will graduate in May 2014. She is from Omaha and attended Burke High School. We figured out that Liz and I have a mutual acquaintance, the son (Nick) of a good friend of mine (Joel). After high school, Liz studied for three years at UNL. She is taking classes this summer while working at the medical center. 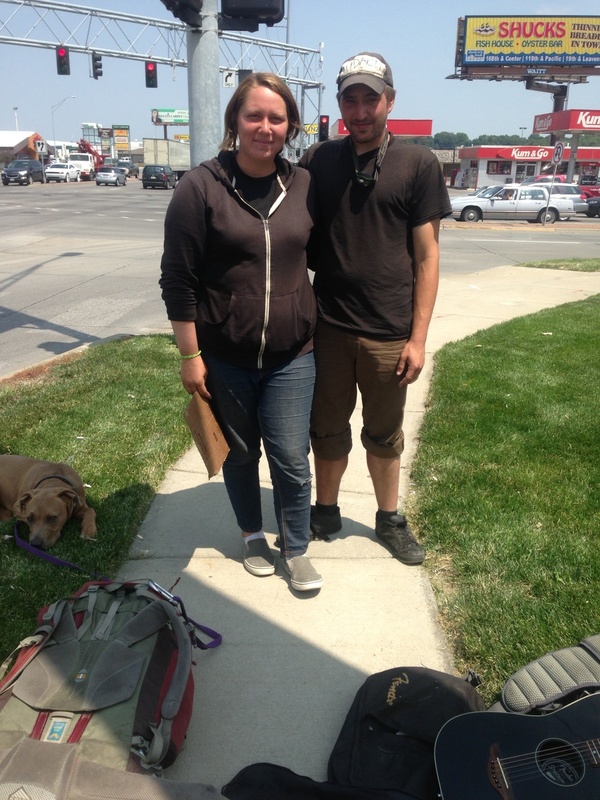 Liz and her husband, Will, were married in May 2012 and they live in central Omaha. I’m generally fascinated by the reactions I get from people. Maybe I look harmless or evoke sympathy, but everyone I have talked with on the Giving50x52 journey has been really nice. Liz was refreshingly engaging and enjoyable to talk with. Usually I’m the one asking all the questions, but she started asking me questions about my experiences during the year. It was a fun conversation. Whatever medical organization that hires Liz when she graduates is going to be very fortunate, but perhaps not as much as her patients. The sign said, “Traveling, broke and hungry”. It was handwritten on a piece of cardboard and held by a young woman as I was heading home from work on July 3rd. Her name is Alexis, who is from Michigan. Her traveling companion with the guitar is Mike, who is from Connecticut. They met about 2-1/2 years ago in New Orleans. They travel the country, work jobs when and where they can get them and move on. This was their third and likely final day in Omaha as they make their way to Kansas City from the west coast. They travel mostly by hopping on freight trains. Sometimes they travel by bus. Traveling with them is their dog, Porter. I asked what they might do with $50 and Alexis showed me her shoes that were worn through. She also said they use gifts to buy food and sometimes a hotel room. 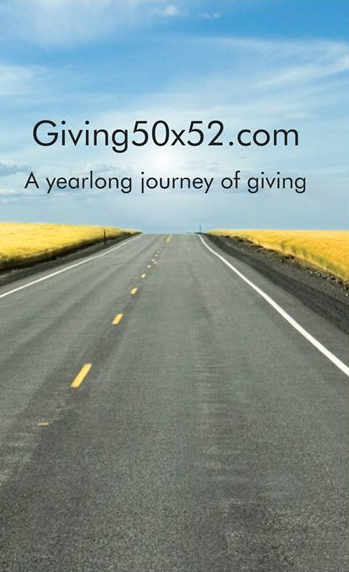 I’ve sometimes referred to the Giving50x52 experience as a journey. But my journey is nothing compared to the journey that these two are on! We had a nice conversation and as I left I wished them well and safe travels. Copyright © 2013 Giving50x52.com & William E. Conley. All Rights Reserved.